Japan is famous for sushi. And breaking out of my previous aversion for fish, I had been sampling the cheap and tasty offerings at Heiroko Sushi Okachimachi branch. 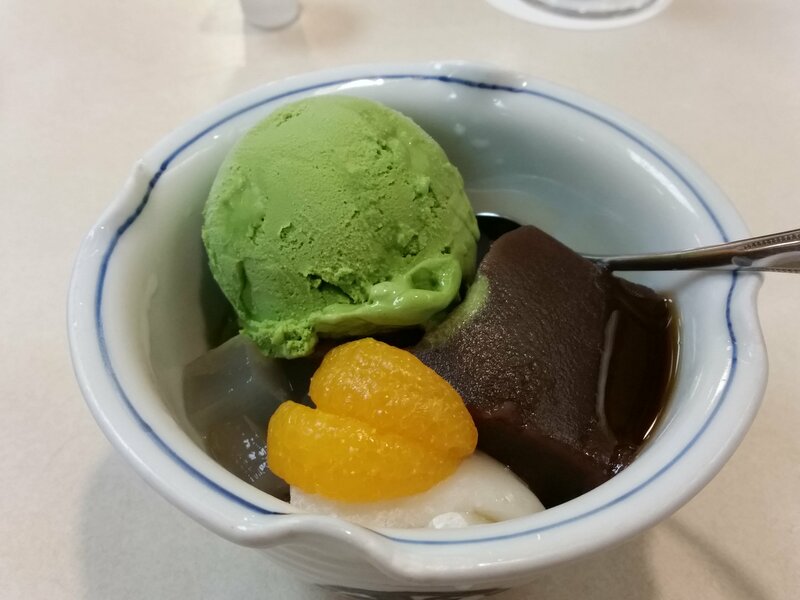 One thing Japan is not famous for is desserts. And although I have enjoyed countless desserts in Japan, I can kind of see why. Firstly, Japanese desserts are not nearly as sweet as desserts in the west, and they use items that we’re used to eating savoury (eg. potatoes), which are then sweetened. This overall lack of sweetness and treading the balance carefully between sweet and savoury is precisely why I like Japanese desserts. Secondly, the Japanese sometimes seem to have a “Let’s throw it altogether” approach that is going to befuddle people’s tongues as much as their mind. A classic example of this would be animitsu. This consists of a block of red bean paste (an / 餡), with syrup (mitsu/蜜) and cubes of agar jelly (kanten / 寒天). Lots of additional toppings are then added, such as rice dumplings, fruits and ice-cream. And I’m going to be honest – it’s a bit weird. I like eating it because it’s like a lucky dip – but I’m definitely not convinced that everything works together. 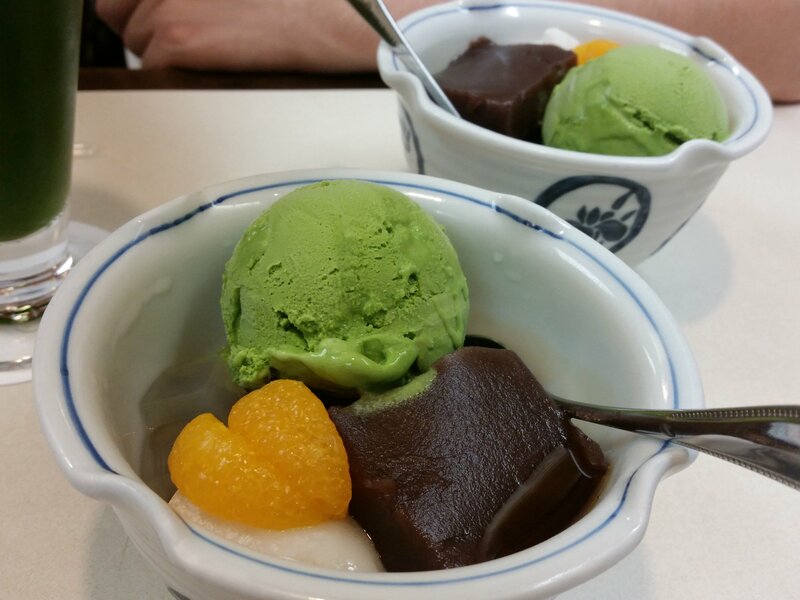 If you’re going to try anmitsu, you should probably go to one of the oldest and most famous stores in Tokyo, boasting a top 5000 ranking within Japan on Tabelog – that is Animitsu Mihashi (あんみつみはし). We went to their main branch at Ueno, which is set over two storeys and has simple wood furnishings, inspired by traditional Japanese design. We were immediately served hot tea, which the servers attentively topped up at regular intervals. We naturally ordered the ‘bit of everything bowl’ with matcha ice-cream (抹茶あんみつ, 610 yen). Mihashi serve black sugar syrup, which has a great flavour but stays on the right side of sweet. For me, the highlight was the gyūhi (求肥), a blended rice flour dumpling which is softer than the chewier white balls known as shirotama (白玉). I also loved the texture given from the whole red beans (赤えんどう豆). What didn’t work so well for me was the mikan (Japanese orange) as it had a sharpness that jarred with the other muted and earthy flavours. I also found the matcha ice-cream a little mild for my tastes. I would have preferred more red beans and less jelly, as the jelly itself is rather flavourless. By contrast, my friend devoured his with relish, so it really depends on what works for you as a sweet. 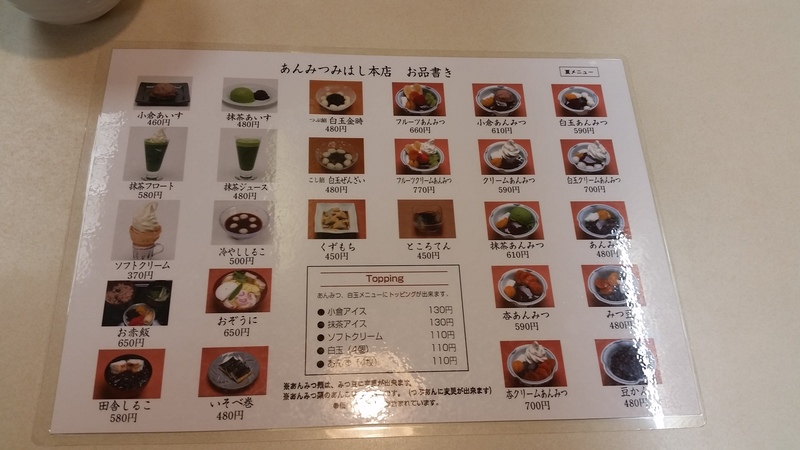 Luckily, there are plenty of variations of anmitsu on the menu, and for 100 yen a pop, you can customise your toppings. There’s also kakigori (shaved ice) on offer. What really got me excited, however, was the matcha juice (抹茶ジュース) for 480 yen – which is essentially just iced matcha and the first time I’ve heard tea described as ‘juice’. Pour in the syrup and slurp down the deliciousness. Anmitsu Miyashi 3.5/5 – Great service, great setting, but maybe I’m not cut out for animitsu? Or at least, I can’t handle so much agar jelly at once! 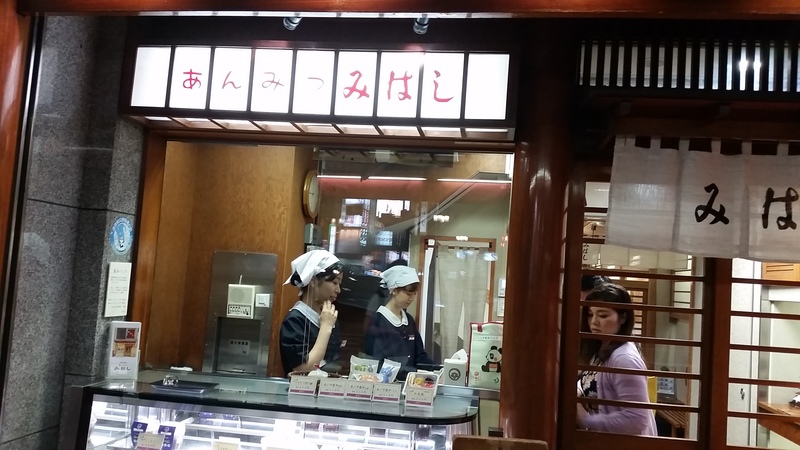 Anmitsu Mihashi in Japan is a store that serves desserts! Including green tea ice cream!